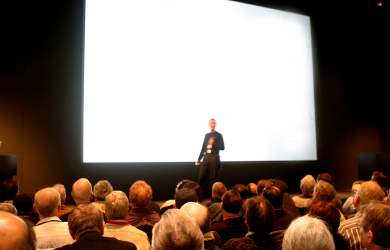 Take your conference to more people by using our on-site live broadcasting service for your next NYC event. This is an easy no hassle solution. We manage set up, provide all technical support and require only a broadband connection at your event. We stream your event from your own site just by including a simple piece of code — we can help you set that up or you can stream the event from our site. Meanwhile, you are able to profit from the increased attendance, without the added venue costs. The sky is the limit with the details of your broadcast. This is more than just a standard video conference. We professionally shoot, font, and add other graphic treatments to provide an engaging experience for virtual attendees, at a cost that is less than you would expect. Live online broadcast of your upcoming conference will grow your revenue both through increased registration fees and increases sponsorship opportunities. Stress-free webinar services by WPRNY. Contact us for a quick no obligation consultation.